When the European Space Agency's Integral’s IBIS instrument captured the gamma-ray burst (GRB) of 19 December 2004, it was so bright that Integral could also measure its polarization, allowing Philippe Laurent of CEA Saclay and his collaborators to look for differences in the signal from different energies. The results that ESA's Integral gamma-ray observatory has provided will dramatically affect the search for physics beyond Einstein. It has shown that any underlying quantum 'graininess' of space must be at much smaller scales than previously predicted. Einstein’s General Theory of Relativity describes the properties of gravity and assumes that space is a smooth, continuous fabric. Yet quantum theory suggests that space should be grainy at the smallest scales, like sand on a beach. One of the great concerns of modern physics is to marry these two concepts into a single theory of quantum gravity. Integral has placed stringent new limits on the size of these quantum ‘grains’ in space, showing them to be much smaller than some quantum gravity ideas would suggest. According to calculations, the tiny grains would affect the way that gamma rays travel through space. The grains should ‘twist’ the light rays, changing the direction in which they oscillate, a property called polarisation. High-energy gamma rays should be twisted more than the lower energy ones, and the difference in the polarisation can be used to estimate the size of the grains. Laurent and his collaborators used data from Integral’s IBIS instrument to search for the difference in polarisation between high- and low-energy gamma rays emitted during one of the most powerful gamma-ray bursts (GRBs) ever seen. GRBs come from some of the most energetic explosions known in the Universe. Most are thought to occur when very massive stars collapse into neutron stars or black holes during a supernova, leading to a huge pulse of gamma rays lasting just seconds or minutes, but briefly outshining entire galaxies. GRB 041219A took place on 19 December 2004 and was immediately recognised as being in the top 1% of GRBs for brightness. It was so bright that Integral was able to measure the polarisation of its gamma rays accurately. Laurent and colleagues searched for differences in the polarisation at different energies, but found none to the accuracy limits of the data. Some theories suggest that the quantum nature of space should manifest itself at the ‘Planck scale’: the minuscule 10-35 of a metre, where a millimetre is 10-3 m.
However, Integral’s observations are about 10 000 times more accurate than any previous and show that any quantum graininess must be at a level of 10-48 m or smaller. “This is a very important result in fundamental physics and will rule out some string theories and quantum loop gravity theories,” says Laurent. 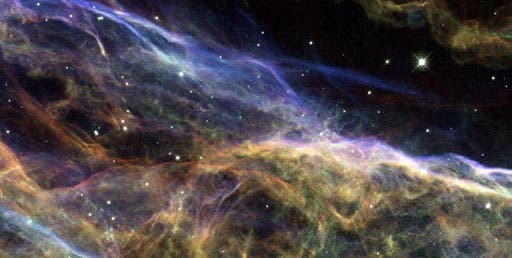 Integral made a similar observation in 2006, when it detected polarised emission from the Crab Nebula, the remnant of a supernova explosion just 6500 light years from Earth in our own galaxy. This new observation is much more stringent, however, because GRB 041219A was at a distance estimated to be at least 300 million light years. In principle, the tiny twisting effect due to the quantum grains should have accumulated over the very large distance into a detectable signal. Because nothing was seen, the grains must be even smaller than previously suspected.